for you know your redemption is neigh"
Memorial Day was originally known as Decoration Day, set aside to decorate the graves of fallen Civil War soldiers. Red poppies are often worn on Memorial Day as a symbol of remembrance and to honor those who died in war. On this Memorial Day weekend, we remember those who sacrificed their lives for "life, liberty, and the pursuit of happiness." Read the Prophets & PRAY WITHOUT CEASING! That the world would W A K E U P.
Time for a worldwide repentance! Pray for those in our government to repent of their wicked corrupt ways. Pray for MD – Has chronic progressive lung problem. Pray for IR – fell and fractured shoulder had surgery. Pray that The Holy One will lead you in Your preparations for handling the world problems. – Have YOU made any preparations? 1Samuel 17:41And the Philistine came on, coming and drawing near to David; and the shield bearer was before him. 42And the Philistine looked, and he saw David, and disdained him, for he was a youth, even ruddy, with a handsome form. 43And the Philistine said to David, Am I a dog that you have come to me with sticks? And the Philistine cursed David by his gods. 44And the Philistine said to David, Come to me, and I will give your flesh to the birds of the heavens and to the beasts of the field. 45And David said to the Philistine, You are coming to me with sword, and with spear, and with javelin. But I am coming to you in the name of Jehovah of Hosts, the God of the armies of Israel, which you have reproached. 46Today Jehovah shall shut you up into my hand, and I shall strike you, and take off your head from you and give the carcasses of the Philistine army to the birds of the heavens and to the beasts of the earth today. And all the earth shall know that there is a God for Israel. 47And all this company shall know that Jehovah does not save by sword and by spear, but that the battle belongs to Jehovah, and He has given you into our hand. I am told that because this was a complete sell out and people were turned away that they are going to have another showing of this on Thursday June 1, 2017. It is listed on the web at site below. It is the story of the 67 war and taking the city of Jerusalem back from the Jordanian occupiers which reunified the city and truly established the State of Israel. Keep checking the web site www.inourhands1967.com to find a local theater near you and to see if you can get advance tickets. This was well worth the 2 hours and a phenomenal history lesson. The American Cemetery at Aisne-Marne, France..
Epinal, France - American Cemetery..
On the occasion of Jerusalem Day, the government approved a new plan to connect the Arab neighborhoods of east Jerusalem to the sewage system and organize an orderly waste collection. The government approved on Jerusalem Day a NIS177 million plan to connect the Arab neighborhood of east Jerusalem to orderly infrastructures, including sewage and garbage collection. Within the plan, which was formulated by the Minister of Environmental Protection and Jerusalem Affairs Ze'ev Elkin (Likud), more east Jerusalem residents will be connected to the municipal sewage system, 33 kilometers of sewage infrastructure will be built, the existing sewage system will be upgraded, garbage cans and garbage trucks will be purchased and set up to collect waste. The plan was discussed at a special cabinet meeting held Sunday at the Western Wall tunnels. The Arab neighborhoods of Jerusalem have a population of 321,113. The Arab population below the poverty line reaches 75%, with the child population below this threshold reaching 84%. More than 37% of all households in the eastern part of the city are handled by the Social Services Ministry, with the average monthly income per capita estimated at NIS 1,900. Residents of Jerusalem's Arab neighborhoods suffer from severe housing shortages and, with it, overcrowding. The plan references the needs of all Arab neighborhoods, inside and outside the security fence, but at this stage, it will be only be implemented in the Arab neighborhoods of Jerusalem inside the security fence. The Arab neighborhoods outside the fence, which belong to the municipal boundaries of Jerusalem, will be dealt with in a separate program. According to the plan, the Ministry of Finance will allocate funds to the Ministry of Jerusalem Affairs and Heritage for the evacuation of the waste transit station, which is located in the Sheep Market area adjacent to the walls of the Old City, and is a source of environmental hazards. Over the past year and a half, the army has rolled out the “Gideon plan,” that cut thousands of positions, dissolved some units, formed others and generally forced the military to do more with less, but it has not all gone to plan in may cases, leaving inexperienced or demoralized commanders in charge. Maj. Gen. (res.) Yitzhak Brick, who has served as the IDF ombudsman since 2008, in his annual report found units waiting months to fill positions, doctors responsible for over 1,000 soldiers, a mental health officer responsible for well over 2,000 soldiers. In addition, Brick said the cost-cutting measures adopted by the IDF led to young officers and non-commissioned officers (NCOs) having generally low morale. The ombudsman found that as a result of the streamlining Gideon plan, there are substantive gaps in the army’s “combat support” units, which provide the logistical back-up for fighting units, driving trucks, cooking food, checking ammunition, maintaining communications equipment, etc. “Due to manpower cuts and the dissolution of career officer positions, one officer carries out the job that in the past would have been handled by two or three people,” Brick noted. Each year, the ombudsman releases a report based on the complaints they received throughout the previous year. On Sunday, Brick released the report for 2016, based off 6,758 written complaints — a slight uptick from 2015’s 6,371. Of the complaints Brick received, the majority — 58 percent — were found to be justified, genuine complaints. Most of these complaints dealt with either medical-related problems — generally poor treatment — or with issue connected to the relationship between commander and soldier. Brick’s report did not indicate that these types of incidents were on the rise in the IDF to a significant extent. The complaints to the ombudsman about low morale and poor medical treatment, however, do seem to be a growing problem, one the IDF is aware of already. From his conversations with officers and NCOs, Brick said he found a severe lack of motivation among young commanders, in light of the low pay, extended periods of time away from family — at a time when many of them are just getting married and having children — and job insecurity brought on by the increasingly limited number of positions available under the Gideon plan. In addition to feelings of “frustration” and low morale among young commanders, Brick also found that this “younger military” is also one lacking in experience. As career NCOs are driven out of the military, some of their positions are being taken by younger soldiers performing their compulsory service. “Compulsory service soldiers in the position [of company sergeant], as good as they can be, are not a replacement for seniority and experience,” Brick said. In response to Brick’s report, the army said that it was working to address some of the concerns of NCOs and young officers, specifically their complaints of low pay. “As part of the Gideon plan and the desire to keep appropriate and high-quality people in career service, an agreement was signed by the IDF and Defense Ministry with the Finance Ministry to improve the salary of new career soldiers,” the army said in a statement. For instance, the military decided to increase the salaries of NCOs from NIS 5,500 ($1,500) a month to NIS 7,500 ($2,000) a month, the army said. According to Brick, there are also significant gaps in the numbers of doctors, mental health workers, nurses and medics needed in the IDF and the number of medical professionals currently serving in the IDF. “For instance, one doctor was required to treat approximately 1,200 soldiers, in combat training; a mental health officer in one of the bases was responsible for 2,300 soldiers,” Brick wrote in his report. Regarding the shortage of mental health officers, it should be noted that the majority of the soldiers who died in the IDF in 2016 committed suicide. The IDF responded to the ombudsman’s report, saying it was aware of the problem and is working put together a plan to address the issue, specifically to decrease the waiting time for soldiers to see a doctor by increasing the number of people at its call centers by 110 percent. In terms of the mental health care issues, the army said it was meeting the requirements set for it. “The wait-time to see a mental health officer in a training unit is not more than two weeks, and in some specific cases, an extra mental health officer is brought in,” the army said in a statement. Of the complaints filed with the ombudsman, nearly 40% had to do with ill-treatment of a soldier by his or her officer, including cases of racism, sexism and homophobia, as well as general abuse. 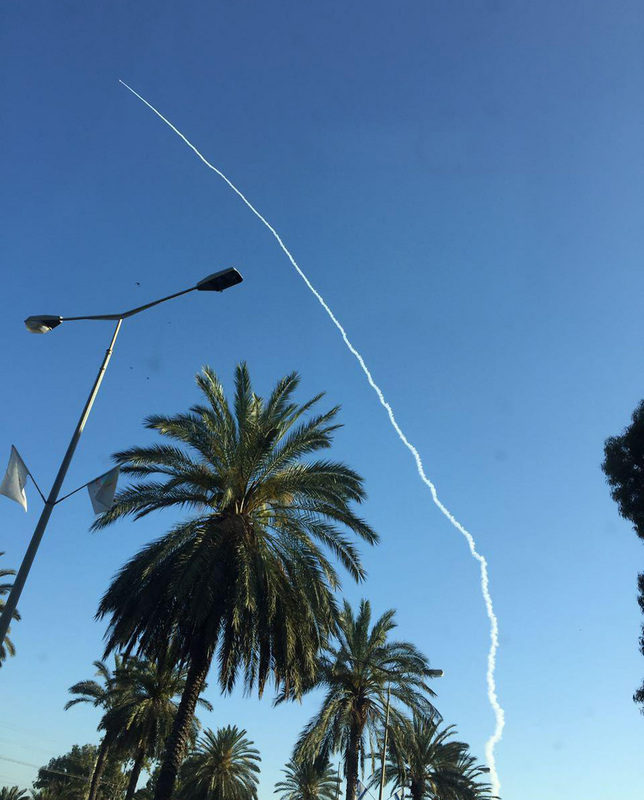 The defense establishment conducts a test launch of a rocket propulsion system in central Israel leaving a trail visible for kilometers; defense officials do not comment on whether test was successful or not. Israel carried out a test launch of a rocket propulsion system Monday morning. The test was conducted from a base in the center of the country and was planned in advance. There was no comment on whether or not the test was successful. The propulsion system could be used to launch Israel's strategic ground-to-ground or ground-to-air missiles, such as the "Arrow," which is an anti-ballistic missile system, or the "Jericho," which according to foreign reports can support a nuclear payload. Given Israel's advances in missile technology, particularly systems designed to create a multi-layered defense umbrella, similar tests are not uncommon. In 2013, a test launch of a rocket propulsion system was conducted which foreign media reported was part of the development of the Jericho ballistic missile. The trail created by the projectile was easily visible in the center of the country, with foreign outlets speculating that the missile had a range of nearly 4,000km. In 2015, during testing of advanced versions of the Arrow system, the Ministry of Defense announced that one test had failed, while another was called off at the last moment. It’s been 30 years since the Tower of David Museum opened its doors as an ancient portal to Jerusalem’s Old City. Now the historic citadel is in the final throes of planning a $30 million renovation, intended to be completed in five years. The goal of the renovation is to create a more seamless transition from east to west, leading from the new city of Jerusalem into the Old City, directly into the museum that is situated just inside Jaffa Gate, one of the major entries into the historic site. The upgrade will change the flow into the museum, with a new entrance complex from the western side of the citadel, now used as the exit from the museum, and connected to the outdoor Mamilla mall through the ancient Byzantine bathhouses under Jaffa Gate. The excavations were carried out 20 years ago, and show the timeline of Jerusalem from a wall from the period of King Hezekiah during the First Temple period (800 BCE), the foundations of King Herod’s palace and water system from 2,000 years ago, Crusader-era pools and the Ottoman city walls of Jerusalem through modern times. The entire excavation has been neglected until now, said Lieber, who has been the director at the Tower of David for nearly five years. When the Tower of David Museum opened 30 years ago, the Western Wall Tunnels and the City of David archaeological site weren’t open yet, pointed out Lieber. The task of the museum has changed, she said, as well as its role as a “monumental site” of the Old City. The renewal project is expected to double the area of the museum from 7,895 square meters to 15,000 square meters with the permanent exhibition area doubling to almost 4,000 square meters. With the renovation, the museum will also gain a glassed-in entrance with a ticket office and coatroom, a cafe and public bathrooms. The $30 million project is being financed primarily by the Clore Foundation, which will be giving 60% of the funding, said Lieber, with the rest from the government, Tourism Ministry and Jerusalem Foundation. Interior Minister Aryeh Deri and his wife, Yaffa, were being questioned separately by police on Monday morning, hours after officers arrested 14 other people in connection with a corruption probe against them. Among those arrested were senior officials from the Ministry for the Development of the Negev and the Galilee, headed by Deri. One of the suspects, the director of a government ministry, was questioned under caution in the case. Deri, who heads the ultra-Orthodox Shas party, and his wife are suspected of offenses related to property deals and possible tax evasion. The investigation, which began in April 2016 and is being run in conjunction with the Tax Authority, was expanded as other discoveries were made, a police spokeswoman said. She said that several people were under suspicion “including a public official and his wife.” The arrests were made so that the suspects would not be able to tamper with the inquiry. Last year, Attorney General Avichai Mandelblit authorized the National Fraud Investigation Unit to launch the criminal investigation into Deri’s dealings. The details of the investigation are under gag order, but it apparently revolves around unreported real estate owned by Deri and members of his family, including a vacation home in northern Israel and apartments owned by each of his nine children. Drone footage shows that the vacation home, in the town of Safsufa near Safed, features a pool and a large patio. On the surface, US President Donald Trump’s relations with Palestinian Authority President Mahmoud Abbas have been surprisingly warm, but that belies a furious critique leveled by Trump at Abbas in their meeting in Bethlehem last week, an Israeli TV report said. Palestinian sources denied the report, saying the meeting was good and to the point. The Channel 2 TV report gave the alleged quotes in Hebrew. Its reporter, Udi Segal, posted some of the alleged wording in English on Twitter. Speaking alongside Abbas after their meeting in Bethlehem, which came on the second day of Trump’s trip to Israel and the territories, the US president seemed to criticize Palestinian support for terror, but praised Abbas’s commitment to peace, saying the PA president had “committed to taking firm but necessary steps to fight terrorism and confront its hateful ideology. The United Nations on Sunday said that it had withdrawn support for a Palestinian women’s center named for a notorious terrorist, saying the move was “offensive” and glorified terrorism. “The United Nations disassociated itself from the Center once it learned the offensive name chosen for it and will take measures to ensure that such incidents do not take place in the future,” said a statement from Stéphane Dujarric, spokesman for Secretary-General Antonio Guterres. The center was named after Dalal Mughrabi, who took part in the 1978 Coastal Road Massacre. Mughrabi and several other Fatah terrorists landed on a beach near Tel Aviv, hijacked a bus on Israel’s Coastal Road and killed 38 civilians, 13 of them children, and wounded over 70. “The United Nations support to this community ended last year and it has asked for the logo of UN Women to be removed immediately. Furthermore, the inauguration of the Center took place after the UN’s association with it,” the statement said. The FBI reportedly warned British intelligence agencies in January that Salman Abedi, who killed 22 people in a suicide bombing in Manchester last week, was planning to carry out a terrorist act. A security source told The Daily Mail on Sunday that US intelligence had told MI5 that Abedi belonged to a North African Islamic State cell that was plotting an attack in the UK. In addition, two people who knew Abedi while he studied at Manchester College in 2012-2013 made separate calls to a terrorism hotline to warn officials of his extremist views, the BBC reported. Abedi, a 22-year-old Briton of Libyan descent, died last Monday when he detonated a bomb as crowds were leaving an Ariana Grande concert. LONDON — British police said they arrested a 19-year-old man late Sunday in connection with the Manchester bombing after a search at an address in the city’s southeast. The man’s arrest in the Gorton area, “on suspicion of offences contrary to the terrorism act”, brings the total in custody in Britain in connection with the attack to 13 men, Greater Manchester Police said in a statement. A 25-year-old man was arrested earlier Sunday in a series of fresh raids by the police in connection with the suicide bombing last week at the Manchester arena in which 22 people, including children, were killed. The suicide bomber was identified as British-born 22-year-old Salman Abedi. It is suspected members of his network are still at large. Investigators say they have a 1,000-strong team working “around the clock” on the probe and have significant details on Abedi’s associates and movements, his finances, and how the explosive was built. Manchester-born Abedi, of Libyan origin, injured more than 100 people when he detonated his explosive as concertgoers left a show by US teen idol Ariana Grande. Authorities in Libya have detained Abedi’s brother and father, while British investigators appealed to the public late Saturday for details of the bomber’s movements in the days before the attack, which has been claimed by the Islamic State group. The police statement said one of the last places he went to before the attack at the Manchester Arena venue was a city center flat, where they believe he may have finished assembling the device. Britain on Saturday reduced its terror threat level from critical — its highest level — to severe. “We should be clear about what this means: A threat level of severe means an attack is highly likely, the country should remain vigilant,” Prime Minister May said. The USS Nimitz, one of the world’s largest warships, will join two other supercarriers, the USS Carl Vinson and the USS Ronald Reagan, in the western Pacific, the sources told VOA's Steve Herman. The U.S. has been working behind the scenes for months to forge a new working relationship with Russia, even enlisting Henry Kissinger. And the Rest of the World has much to Remember and Thank America For . . . for the Incredible Sacrifices the RED, WHITE & BLUE has made at each Corner of the Planet, to the extent that American Courage and Generosity can NEVER be Repaid. It took THIRTEEN BALLOTS to decide who the New Leader is of the Canadian Conservative Party – His Name is Andrew Scheer, Born in Ottawa Canada, Educated in Ottawa and Regina Saskatchewan, served as an MP (Member of Parliament) from Saskatchewan for 13-Years. Scheer has been a Politician since he was 25-Years Old, with a very Brief Pre Political History after University in the Insurance Industry. Andrew Scheer was NOT the Politician I wanted . . . Maxime Bernier Was – and between the two of them, the Final Vote Difference Gave Scheer a LESS THAN 2% VICTORY. In essence . . . The Canadian Conservative Party VOTED for a Party Insider - WHO I VERY MUCH DOUBT WILL STIMULATE THE COUNTRY. That said – He will get my Vote when the time comes, but hardly my Full Throated Support . . . UNLESS he can Prove me Wrong. I’m Sick & Tired of Professional Politicians. I WATCHED THE ENTIRE CONVENTION LIVE AS IT WAS HAPPENING . . . and Noticed Something, which was REALLY MISSING from the Entire Event. How Excited Can I Be . . . About a CANADIAN Leadership Convention, Broadcast LIVE on all the Major CANADIAN Media, for the CANADIAN Leadership of the CANADIAN Conservative Party, when there wasn’t even ONE CANADIAN FLAG ON STAGE, let alone a Massive Canadian Flag Backdrop, as we are accustomed to seeing at all American Political Events, as we should have seen on this CANADIAN CONSERVATIVE STAGE? It’s Hard To Get Excited About A Country That Doesn’t Get Excited About Itself. Our North American LEFT is DESTROYING History, not by BURNING BOOKS as the Nazis Did, but rather, by REMOVING & BANNING Books from Schools and Libraries. And we just don’t see it . . . AT LEAST NOT YET. THE YANKEES & LEFTIST ELITISTS . . . Are DESTROYING the Heart and Soul of DIXIE, as if every Southerner was a Slave Owner . . . and as if NO YANKEES Profited BIG TIME on the Slave Labor of the Few Southerners who Owned Slaves. LET ME MAKE THIS 100% CLEAR . . . I LOVE DIXIE and everything about it, which has nothing whatsoever to do with the HIDEOUSNESS of the Slave Trade. I LOVE the Southern Culture, Hospitality, Politeness, Gentility and their Love Of Life. IT BREAKS MY HEART . . . when I see and read the news of Civil War Confederate Statues being Removed from Public Spaces, as if DIXIE'S Contributions to the Greatest Country Ever is Somehow an Embarrassment. WHEN ANNE AND I ARE IN TEXAS . . . We’re Home, because the People make us feel at Home. We love the Food, the Music, the BBQ’S, the History . . . and we always have time for a Beer from the Bottle and Dance a Texas Two Step at Luckenbach. And at least once every time we’re in Texas, we make it a POINT, akin to a PILGRIMAGE, To Visit The ALAMO. AND THAT TOO . . . If the LEFT ever gets their way, I am all but Positive, they will try to DISASSEMBLE the Alamo any way they can, just as they sent the STARS & BARS to the Dustbin of History in South Carolina . . . since the Alamo Reflects a Time when Americans Defeated Mexicans, supposedly “stealing” their land and culture, even though no shortage of Mexicans fought on the Side of the Nascent Republic of Texas, against the Tyranny of Santa Anna. If we don’t know what happened Yesterday, AND KNOW WHY AND HOW IT HAPPENED, how in the world can we prepare for Tomorrow? AND IF WE DON'T DEBATE ALL THE ISSUES . . . How can we possibly Understand any of the Issues? Time Machine By HG Wells 1895 . . . Could Have Been Written Yesterday. I remember DEVOURING the HG Wells Classic – TIME MACHINE, which was Published in England in 1895, followed by anther HG Wells Classic, also Published in England (1898) – WAR OF THE WORLDS. WAR OF THE WORLDS WAS A WORK OF FANCIFUL SCIENCE FICTION . . . But Time Machine, whether HG Wells Meant it or Not, was an INDICTMENT on Society, which is 100% Relevant to our Society Today. In Time Machine, the ORIGINAL, not the Altered Movie Versions, a Time Traveler (Narrator) went Far into the Future, to discover a Society Governed by Two Cultures. The First were the ELOI, a Gentle Group of Almost Child-Like People, resembling the Flower Children of the 1960’s, who spent their time during the day, Wistfully Enjoying Life with ZERO Responsibilities . . . Creating, Growing and Building NOTHING, who lived and Frolicked in the Sunshine. AT FIRST . . . the Narrator (Time Traveler) saw the Eloi Society as Utopian . . . but wondered nonetheless . . . How did they provide for themselves? Then . . . as Night and Darkness began to fall, the Eloi Panicked, running for shelter, because that was when the MORLOCKS, a disfigured and Barbaric Society came to the surface from their Underground Caverns, where during the Day, they Created the Food and “Things” the Eloi Needed to Survive, so they could enjoy their Utopia, for which the Price to the Eloi, was that the Eloi were FOOD for the Morlocks. UNFORTUNATELY . . . Time Machine has all but disappeared from the Lexicon of Important Novels, Which All Delivered Strong Social Messages. I also remember . . . as Distinctly as if it were Yesterday, and as if I didn’t just Read-It, but Rather Lived-It, when in early High School, I read LORD OF THE FLIES, written in 1954 by William Golding, also a British Published Novel, which was the story of a Group of British Preteens and Early Teens, who were Stranded together on an Island, held to their own Survival Devices. In the END, the SMALL Group of Children, who Organized, Built and Planned for their Escape and Rescue from the Island, were OVERPOWERED by the larger Group, which were Created into a MOB through Fear, Intimidation, and Misinformation IN LIEU of Work and Discipline, which led to the Murder and Terror of the FEW. LORD OF THE FLIES was the PERFECT WRITTEN ROADMAP TO A DYSTOPIAN SOCIETY, which established a Reality every Young Person should think about in their Earliest Cognitive Years, when they can understand the difference between those who Create and those who Destroy. INCREDIBLY . . . Lord of the Flies has been all but BANNED from Schools and Libraries throughout North America, because the LEFT think its Symbolism is Too Violent, Racist, and Bigoted . . . UNLIKE the Crap They Flood the Minds of our Children with Today . . . Sally has Two Daddies – and Jim thinks he’s a Girl. And there are NO LOSERS, and everyone gets a Trophy for Trying. WHO DOESN’T REMEMBER THE ADVENTURES OF HUCKLEBERRY FINN? THE ADVENTURES OF HUCKLEBERRY FINN AND TOM SAWYER, his best friend, was first Published in England in 1884, followed in 1885 in the USA, written by America’s (in my opinion) Greatest Author - Mark Twain, which was the Story of an Abused and Abandoned Boy, who by his Sheer GRIT, Courage, Determination, Street Smarts, and Friendships survived a Criminal Father, Injun Joe, and a Life of Depravation. HUCKLEBERRY FINN IS AN AMERICAN CLASSIC . . . Adventure Story that has all the Great Elements of Exciting Reading, which also illustrated what it was like to grow-up in the Deep South after the Civil War . . . WHICH TOO IS ALL BUT BANNED from Schools and Libraries, much for the same reasons Lord of the Flies was Banned. IN 1903 . . . Irish Writer/Playwright - George Bernard Shaw Wrote - “He who can, does. He who cannot, teaches” as a Major Part of his Book-Series; Man and Superman, which we in this Modern World have Reshaped as . . . “THOSE WHO CAN DO – THOSE WHO CAN'T TEACH”. I was aware of this Shaw TRUISM as a very Young Man, but actually, more perhaps, as a Cognitive Older Boy, but I NEVER assumed how PROFOUND these few words were, and how Horribly Damaging this REALITY would have been, and has been to our Society. THE NAZIS WERE RIGHT . . . Take the Children Young Enough from their Parents, BEFORE their parents had a chance to fill their Heads with Ideas, and let the Nazis FILL THE CHILDREN’S HEADS WITH THEIR OWN PRECONCEIVED CONCEPTS . . . And The Damage Will Be Done. SO . . . When we ask ourselves – how can so many of our Millennials, Journalists, Entertainers, Tech-Billionaires, Politicians, Bureaucrats and Members of the Courts be so STUPID . . . THE ANSWER WAS WRITTEN BY GEORGE BERNARD SHAW 114-YEARS AGO. Have A Wonderful Memorial Day . . . And Thank A Vet. Labour leader Jeremy Corbyn calls ceremony honoring terrorists involved in abduction, murder of Israeli athletes 'poignant'. Labour UK chief and Opposition Leader Jeremy Corbyn visited the graves of terrorists involved in the abduction and murder of Israeli athletes in the 1972 Munich Massacre in a ceremony honoring the terrorists. The visit took place in October 2014, and was documented by Corbyn on the Morning Star website, which is affiliated with Communist Party of Great Britain. At the time of the visit, Corbyn was not leader of the UK Labour Party, but had already served as an MP for the party for more than three decades. In an article describing a ceremony honoring several slain Arab terrorists involved in the murder of Israeli athletes, Corbyn called the event “poignant”. The article, entitled “Palestine United”, noted that participants had laid wreaths on the graves of the terrorists, whom Corbyn claimed had been liquidated by Israeli agents in the 1990s. Israeli government says it is in contact with UN to resolve issue of illegal construction at Government House. After repeated delays, the state finally responded Sunday to the request for an interim injunction filed by Regavim against the illegal construction carried out by the UN at the Government House in the Armon Hanatziv neighborhood. The state admitted for the first time that the extensive construction activity there, including works to preserve the historic buildings in the compound, as well as the construction of additional illegal structures in the compound, were carried out without permits. "The planning and building laws of the State of Israel apply to the compound and to the works that are the object of the petition, and the UN is expected to act in accordance with the principles of the relevant planning and building laws." In a petition submitted by the Regavim movement to the Jerusalem District Court two months ago, it was revealed that the United Nations had committed a large number of building offenses during the past year, in a site registered in the Land Registry in the name of the State of Israel. The state expressed its opposition to issuing an interim injunction prohibiting continued construction of the compound, since the UN enjoys immunity from prosecution and legal action against it. The government's intention was to establish a ministerial team to examine the government's policy on the issue, and at the same time examine the possibility of using appropriate tools in addition to the construction being carried out in the area, including measures against Israeli entities involved in the construction work. In this context, the State announced that it did not object to Regavim's request to include the Israeli construction companies involved in the illegal construction activity as respondents to the petition. "In addition to all this, the State is working through the diplomatic channels with the aim of resolving the issue of construction in all its aspects, including setting an outline with the UN regarding existing construction and future construction, as far as the UN will do. This dialogue is in favor of regulating the issue. " Regavim responded to the state's position by stating that violations of the law must be dealt with without delay. "Illegal work must be stopped immediately, even by means of an order against the Israeli companies that are actually carrying out the building violations while the law is in place," said attorney Avi Segal of the Regavim movement. Rift between Saudi Arabia and Qatar to widen? Saudi Arabia continues to block Qatari Al-Jazeera's broadcasts, and attacked Qatar for opposing Iran's isolation. Bloomberg TV on Monday reported that United Arab Emirates Foreign Minister Sheikh Abdullah bin Zayed bin Sultan Al Nahyan said that the Gulf States were suffering a "severe" crisis over the proper attitude towards Iran. One minister wrote on Twitter that the disagreement constituted a "serious danger" to the six Gulf Cooperation Council (GCC) member states. The tension rose after Qatar's government news agency publicly criticized the efforts to isolate Iran. Though Qatar officials said the criticism was written by "hackers" and removed it, Saudi media still presents Qatar as having strayed from the GCC's stance. Qatari Emir Hamad bin Khalifa Al-Thani spoke on the phone with Iranian President Hassan Rouhani last weekend. According to Rouhani's website, Iran is "ready for talks aimed at reaching a real agreement." "We want the Islamic world, which suffers from divisions, to advance towards peace and brotherhood. To this end, we are willing to work to do whatever we can in order to achieve a true peace." Ransom letter sent to Miami Beach yeshiva, warns explosives planted in building will be set off if $25,000 not paid. A yeshiva in North Miami Beach was evacuated Sunday evening after a threatening message demanding ransom be paid was sent to the school. The threatening email claimed that Yeshiva Toras Chaim Toras Emes had been rigged with explosives and would be blown up if the demands were not met. The author of the email demanded the yeshiva transfer $25,000 via Western Union by May 31st. “I’ll be brief,” the message read, Yeshiva World News reported. “If you try to contact the police, I’ll know. I also have access to your computers and email addresses. “Do as I say and no one will get hurt. The message was received at approximately 6:30 p.m. Sunday evening, prompting an evacuation of the yeshiva. Police were called to the yeshiva and inspected the building for any possible bombs. To be removed from this News list, Please click here and put "Unsubscribe" in the subject line.